In the past few years I have discovered that both good reds and glossy, Blackspot resistant foliage can be had when using 'Scarlet Moss' in breeding. The seedling shown here is 'Scarlet Moss' X 'William Baffin' from last year's seedlings. Working with 'William Baffin' is a bit more of a waiting game than usual, as its seedlings often don't start to flower until year two. (L83 seedlings behave this way also, which is not really much of a coincidence since the Explorers come from similar genetic backgrounds: heavy R. rugosa influence) I have loads of seedlings from last season that I hope to see flower for the first time in the next couple of months. 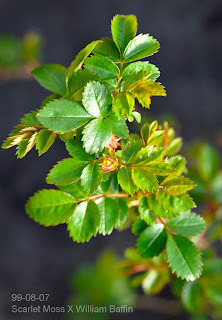 I am hoping that a few of the 'William Baffin' seedlings show excellent disease resistance, strong red coloring and very good Winter hardiness. This particular cross "feels right" to me, bringing together one of the best of the Explorers and one of the best Moore roses with heavy 'Dortmund' influence. Photos of the blooms will follow, when it happens. That lime green glossy foliage looks truly magnificent. I hope it has the disease resistance of 'WB'! Also, I can't wait to see the flower colors here, (..if they were mine I would love to see deep shocking scarlet reds). I admire your PATIENCE here! I am not so sure I can muster such a degree of long-term patience myself, lol. I wish someone would come up with some trick to get them to ALL bloom in the first few months following germination, regardless of genetics. As far as "patience" goes, the work eventually falls into a rhythm so that no matter what seedlings you get from year to year, there will ALWAYS be new things blooming for the first time. They may be they 6 week old seedlings, or plants you have tended for three years or more before seeing their first flowers. This makes it less painful to cultivate crosses that take at least two years to bloom. Excellent choice there! William Baffin is extraordinary in its cold hardiness, vigor, rebloom and health. Have often wondered why it has not been used more in hybridizing, so this is a good surprise. Am crossing my fingers!